Experience state-of-the-art dentistry at its finest. Because of our success in Scottsdale, the Arizona Center for Laser Dentistry, office for …. Our full-service family, general, cosmetic dental office in North Scottsdale has raised the standard of care for dental patients by utilizing advanced laser technology to reduce the pain normally associated with some dental procedures. When using the laser, there is no need for drills or needles. The laser also provides more comfort, eliminates numbness and promotes faster healing. LASER = No Shot. No Drill. No Anesthesia. In addition, Dr. DiVito uses the latest laser technology to treat root canals. This new technology called photon induced photoacoustic streaming or PIPS ,gently reduces biofilms, which have been shown to be the major contributor to root canals abscess and the need to retreat previously treated root canals. Ask Dr. DiVito more about this revolutionary laser technique, and the GentleWave® procedure. — Our goal is to provide our patients with the highest quality dentistry within a warm, welcoming and friendly environment. Our office continues to use mercury free, biocompatible alternatives to treat our patients. New patients are always welcome to our Scottsdale dental office! ONE VISIT CROWNS – You can have custom-made, natural looking dental crowns in just one office visit. COSMETIC DENTISTRY – We give you a winning smile Glo tooth whitening, enamel shaping, bonding and custom-made laminate veneers which are all part of our cosmetic dentistry options. TOOTH RESTORATIONS – Ceramic restorations that are both economical and beautifully esthetic can be performed in one day. They include crowns, veneers, bonding onlays and inlays. TMJ TREATMENT – We provide non-surgical treatment of TMJ and the resulting jaw and neck pain due to joint injury or trauma with Dr. DiVito’s proprietary, comprehensive approach to this issue. DENTAL IMPLANTS – Permanent dental implants to replace missing teeth due to periodontitis, tooth decay or injury are also one of the services we offer. INVISALIGN – Invisalign is the no braces, no wires method for straightening teeth, correcting overbites, under bites, crowded teeth or closing gaps between teeth. Invisalign is available at our office. ROOT CANALS – Root canals or endodontics, using advanced Laser Technology to save a damaged tooth, is a specialty of this office. Dr. DiVito’s uses his revolutionary technique (PIPS) to more gently and effectively prevent and treat root canal abscesses by more thoroughly decontaminating the area. 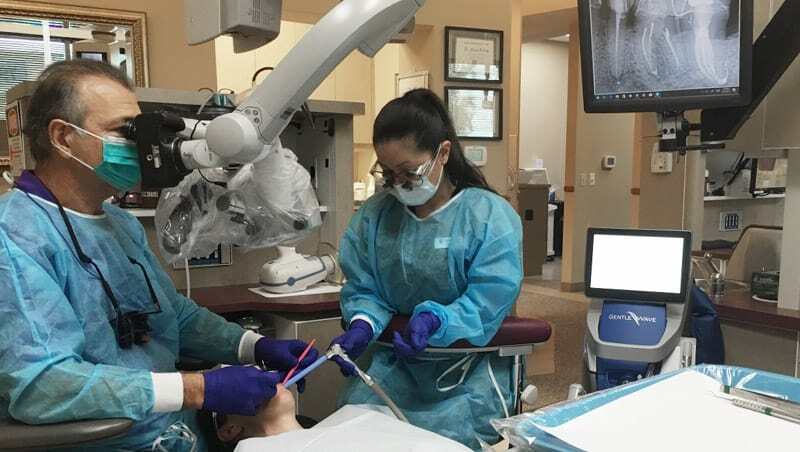 ROOT CANAL DISINFECTING – If you have a current abscess or infection in an existing root canal, we can decontaminate the infected tooth with a revolutionary laser application (PIPS) that is more than 10 times as effective as current best-practice methods. DENTURES (COMPLETE AND PARTIAL) – Gain a beautiful smile with complete or partial dentures, which will help with chewing, support your facial structure (for more youthful appearance), improve your speech and provide you with a new-found confidence. Want to make an appointment? Call (480) 990-1905. Our friendly staff will be here to help you. The book offers up-to-date information on all aspects of the use of lasers in endodontics, focusing especially on the various laser applications, including primary and permanent root canal therapies, retreatments, apical surgery and pulp therapy. Every laser technique used in endodontics is carefully described and illustrated, with detailed coverage of both conventional methods and more recent developments such as laser-activated irrigation and photon-induced photoacoustic streaming.